At 9 am on our third day in Beijing, we set out on a private tour (photo above: Paul with our guide Mike) of the Forbidden City, a vast complex of buildings, completed in 1420, as the home of the Chinese Emperors and their court. Even in early spring and cool temperatures, there were thousands of visitors at this famous tourist destination - most of them Chinese from rural areas, travelling in groups. Foreign tourists were conspicuous by their absence in the face of the global recession. Our guide told us that one of biggest problems for tour guides is the fact that Chinese tourists wander away from their group and get lost in the labyrinthine complexity of the Forbidden City. At the height of the season, he claimed, there can be as many as 15,000 lost persons ‘turned in’ at the ‘Lost Persons’ office. One may wonder why a Chinese communist government would glorify this gigantic symbol of arbitrary rule by all-powerful Emperors in thousands of years of dynastic history, and encourage its citizens to make a pilgrimage to see it. This is a good question with no simple answer. But if the Forbidden City represents some of the worst elements in Chinese history, it also stands as proof that China is a powerful and distinctive culture and has been for a very long time. We duly tramped through the Forbidden City marveling at the scale of it all, but amazed that almost none of the buildings were open for viewing. Tourists come great distances to see one of the wonders of the world, but are exposed to very little that resembles life as it was lived here. 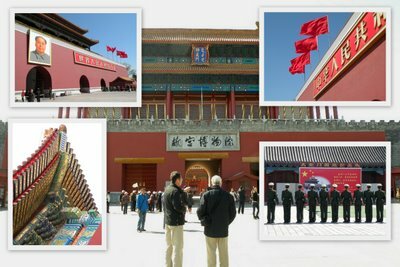 There are some changes in the works, however; later this year, the government will open Juanqinzhai (Lodge of Retirement) in the northeast corner of the Forbidden City. This is a theater room built by Emperor Qianlong in the 18th century, which was recently restored with painstaking care by Chinese artisans. Among the outstanding features of this room are the silk murals done by Giuseppe Castiglione, a Jesuit missionary credited with introducing Western perspective painting techniques to China. Finally, after trekking through miles of the Forbidden City we come to the gate where Chairman Mao Zedong famously addressed the adoring crowds in Tian’an Men Square on October 1, 1949 to proclaim the founding of the People’s Republic of China. Mao stood on a balcony of the gate facing away from the Forbidden City. He never entered the Forbidden City. He didn’t destroy it, but he saw it as a symbol of the worst of Chinese history. Outside the gates of the Forbidden City, we crossed the street through a pedestrian tunnel with a security checkpoint to be admitted to Tian’an Men Guangchang (the Square of the Gate of Heavenly Peace). The security is to prevent people from holding up banners for some protest or other. Nothing much to see here except the vastness of it all, and to be reminded of all the wonderful and ugly things that have taken place here. The twentieth anniversary of the 1989 protests was upon us and authorities were making sure there would be no opportunity for a reprise. The main building in the square is Mao’s Mausoleum, where the Chairman’s embalmed body is raised daily from its refrigerated chamber for morning and afternoon viewing. On either side of the square are two other massive buildings: the China National Museum and the Great Hall of the People where the National People’s Congress meets. It’s an impressive array of buildings and history and for the most part it is without any ideological oppressiveness. The heavy-handed propaganda and leader-worship of the past is pretty much gone. It was now lunch time and Marita had scouted out a new French restaurant much-praised in the expat press and located just off Tian’an Men Square. Standing there, in that square, one could not help but remember the images flashed across news screens around the world in '89. Lunch at the grand Maison Boulud seemed somehow disrespectful of all the history that had been lived just blocks away. But we had come a long way and were determined to experience all of Beijing - the old and the new! Maison Boulud, located in an upscale enclave of restaurants and stores in what used to be the U.S. consular compound and now known as Legation Quarter, is owned by master chef Daniel Boulud, a restauranteur in New York. 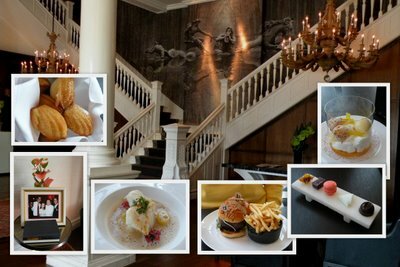 The setting is elegantly traditional, and the menu imaginative. Our waiter urged us to try the DB (Daniel Boulud) Burger, which we found to be excellent – a sirloin burger filled with braised short ribs and foie gras. Dessert - the Tropical Fruit Coupe de Glace - was beautifully presented and delicately flavored. We were also pleasantly surprised by the quality of the Chinese wine served at Maison Boulud. It was a cabernet franc 2004Tasyas’ Reserve from Grace Vineyard in Shanxi province.